Building on its award-winning predecessor, developers of the all-new Mazda 3 set out to do no less than come up with a car that actually interacts with its owner on several levels. On the surface, it's a top quality means of transport, delivering an unmatched combination of performance, fuel efficiency and functionality in a package that's as safe and practical as it is stunning. Here it follows in the footprints of its new generation forerunners: the Mazda CX-5, a compact SUV that drives like a car, and the new Mazda 6, which more recently took the mid-sized class by storm. Like them, Mazda's all-time bestseller gets the full range of lightweight SKYACTIV-Technology, optimised like the latest adaptation of the company's KODO design for a compact's size and agility. But its looks are more than just eye-catching. They grab hold of the senses, bonding man and machine. 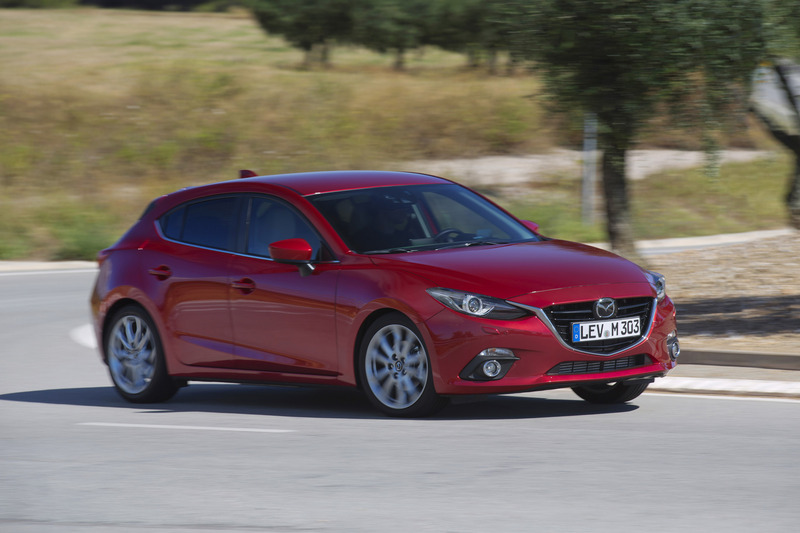 The relationship will flourish as the new Mazda 3 exceeds expectations at every turn. In the way the door opens or how the controls are in exactly the right place. The brand-new interior connects occupants with the car, whether behind with wheel having a typical Mazda one-with-the-car Jinba-Ittai experience or enjoying the trip in the relaxed, secure comfort of the passenger space. Like a true partner, the new Mazda 3 is revitalising, inspiring people to expand horizons. Look at how it handles, devoutly responding to driver input, cornering and delivering feedback with choreographed precision. It even links occupants to cyberspace with a new mobile connectivity concept, safely and conveniently bringing what they otherwise take for granted into the vehicle. It's all part of Sustainable Zoom-Zoom, Mazda's vision-in-progress for safe and eco-friendly vehicles. Exceptionally low harmful emissions let one enjoy the drive with a clear conscious. In fact, it's at or near the top of its class in a list of other categories, too, from interior space and aerodynamics to acceleration, braking and more. The intelligent design and sophisticated interactivity of the new Mazda 3 will simply bring out the best. This car is going to grow on you. Temptation. One look at the all-new Mazda 3 instantly stirs the spirit, taking hold of the onlooker before tightening its grip. It draws one in, getting under the skin. A connection has been made, sewing the seeds of a long relationship. Behind this magnetism is the "KODO - Soul of Motion" design theme. Inspired by the beauty and power of nature, Mazda developed KODO to take its distinctive sense of vitality and agility one step further. For an uncompromising new generation of cars that simply beg to be driven. 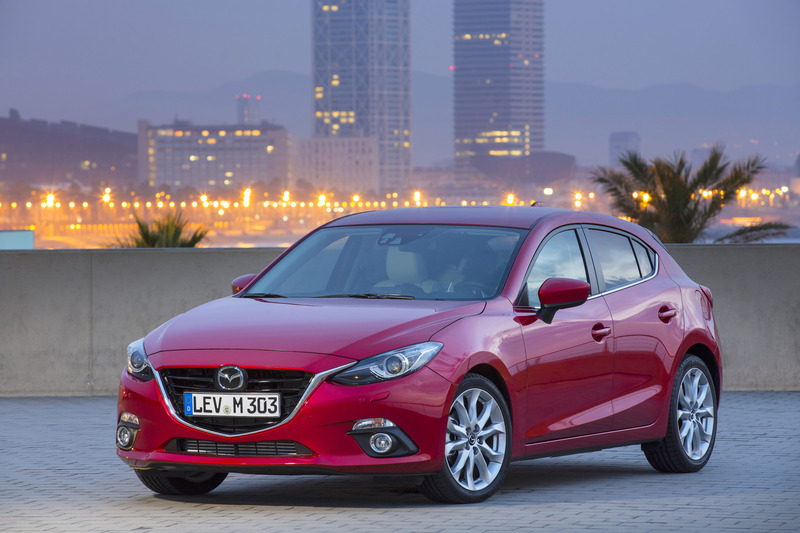 Always acclaimed and always distinctively Mazda, the latest Mazda 3 nevertheless marks a rebirth of sorts. Mazda has come up with a truly passionate expression of dynamic motion, evolving KODO's boldness for the strong, energetic C-segment proportions. Like prior KODO models, the all-new Mazda 3 features a firm stance enhanced by the compact looking, rear-leaning cabin. Lower and wider than the current model, the car's raked profile, rising dramatically towards the rear and bolstered by the boldly flared fenders and large sporty aluminium wheels at the corners, conveys agility and strength. And Mazda's characteristic off-the-line power. At first sight, the new Mazda 3 ignites a fire in the heart of the beholder, sparking the imagination to conjure up the possibilities. The energetic tension is united with an enticing - and refreshingly uncommon - sensation of rhythm. Reflections off the glossy surface textures change like an emotion with the lighting and the viewer's position, sometimes subtly, sometimes drastically, but always capturing the senses and lifting the mood. This is only one example of the craftsmanship and painstaking attention to detail that went into this car. One of Mazda's priorities was to achieve a new level of precision and quality with the fit and finishing. 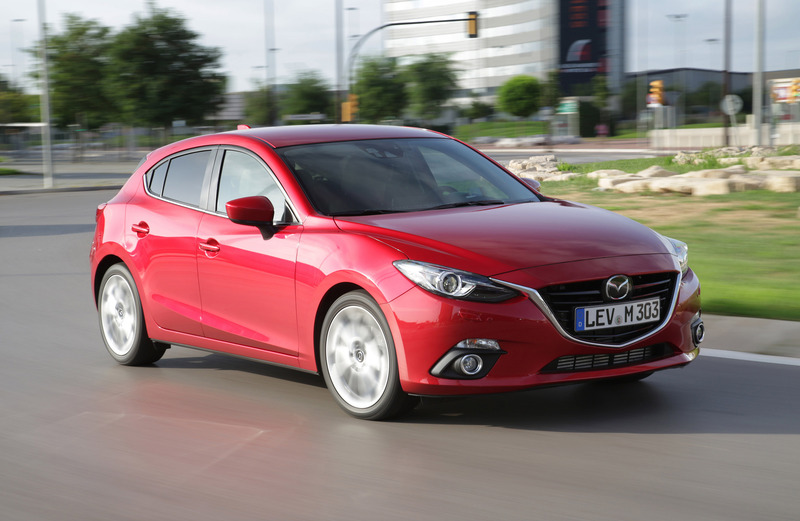 The company therefore brought together design, development and manufacturing specialists to figure out ways of enhancing the joy of driving and owning the new Mazda 3. To minimise the gaps between body panels and doors, for instance, they studied everything from the way the doors were attached to paint thickness tolerances on the edges of the body panels. 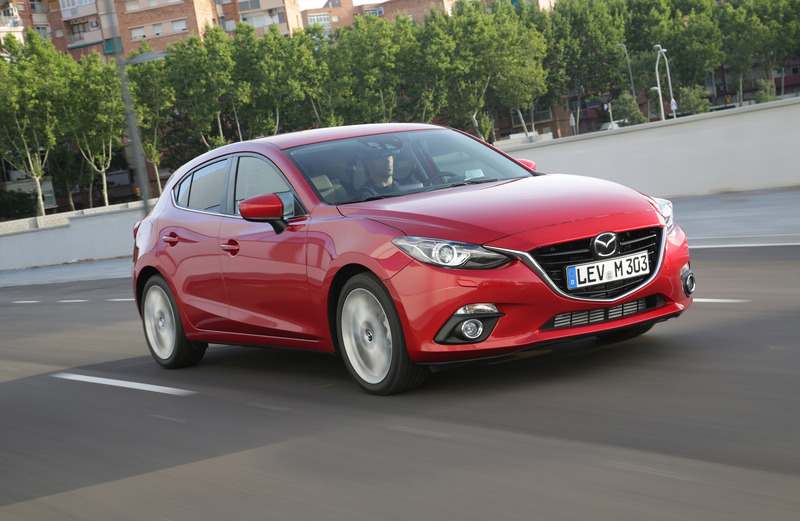 By taking a fresh look at improvement potential, Mazda was able to set stringent new targets. As a result, the gaps between the front door and fender, which tend to be wider than others, are smaller on the new Mazda 3 than on many premium-class vehicles. Like its siblings, the new Mazda 3 gets the distinct KODO face, featuring the contoured grille and the sculpted signature wing. The latter flow out from under the vertically enlarged grille to the headlamps, which glint like the eyes of a predator staring ahead. The Mazda 3 was given a distinct headlamp design. Their sleek, sharp shape and clean structure was made possible by positioning the turn signals outside the headlamp assembly. Consisting of LED light sources, inner lenses and a light-guiding ring, the eye-catching lighting signature imparts a "glaring" presence that immediately says Mazda. KODO is clearly about motion, expressed on the new Mazda 3 with the undeniably rhythmical flow of its simple, solid character lines. Extending back from signature wings and headlamps along the sides of the car, they unite the powerful fenders to emphasise the car's nimble agility. Even when stationary, these shapes along with the optically low centre of gravity allude to the impression of pent-up energy, building expectations about the car's performance. 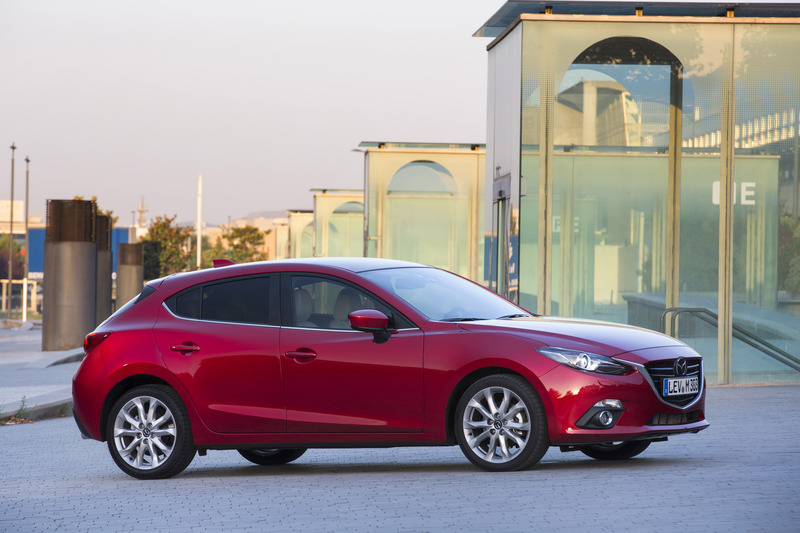 The enlarged wheelbase - 60mm longer than the current Mazda 3's - allowed designers to shorten the front and rear overhangs for a more powerful KODO-inspired stance, in the process creating more space for the engine and improving crash safety, too. The Mazda 3's hind quarters, meanwhile, parallel the front in many ways. Like the grille, the brawny tailgate seems to protrude. Every bit as inspired as the headlamps, the tail lamp signature, which features sporty round tail light rings and quality two-tone internal finishing, is perhaps best described by the words "zooming away". Speaking of which, by now the beholder may have an urgent desire to get behind the wheel of the all-new Mazda 3. Satisfying this yearning will bring the first physical contact with the car - a surprisingly pleasant experience in itself. Because in keeping with their focus on quality, developers meticulously analysed how people interact with the door, tweaking the hinges and moment of inertia to make the operation feel as natural as possible. Consequently, opening and closing the doors of the new Mazda 3 is an exceptionally smooth, linear procedure, without the customary "weighty" feel. Together with the striking looks, it's this sort of extraordinary thoroughness that enlivens the bonding process owners are destined to undergo with their new Mazda 3. It starts when they first catch sight of the car. Just wait until they get inside. The all-new Mazda 3 comes in a choice of nine body colours to commemorate its arrival in the bold world of KODO. They include Soul Red Metallic, developed as perhaps the most emotionally appealing red ever, as well as two brand-new Mazda colours: the sophisticated expression of Titanium Flash and Deep Crystal Blue, a hue inspired by the power and speed of a lightning bolt piercing a dark sky. Mazda's new compact is also available in Blue Reflex, Snowflake White Pearl, Aluminium Metallic, Meteor Gray, Jet Black, and Arctic White. If the body of the all-new Mazda 3 raised expectations about the interior, then the interior is destined to overachieve. Open the door, and behold a treasure chest of refined comfort and ergonomics, with the seductive charm of surfaces that beg to be touched, and the sophisticated purity and clean coherence of a space that's more people-oriented than ever. This first impression is unlikely to disappoint. Destined for all coming Mazdas starting with the new Mazda 3, the freshly compelling next-generation interior follows a revolutionary new concept: partitioned yet unifying. Specifically, the cabin is divided into zones, with a snug cockpit that seems self-contained in the way everything is positioned to promote a driving experience that's as safe, enjoyable and stress-free as possible. The passenger space, in contrast, offers a reassuringly open, spacious and relaxed atmosphere. The centre-focused driver's zone contrasts with the relatively low passenger side dashboard, which manages to simultaneously impart freedom and security. The asymmetrical centre console marks the border between the two zones, demarcating their respective properties. But it manages at the same time to establish a feeling of connectedness, blending the two zones to establish a kind of balance between the driver and passenger, who can share their experiences: the joy of driving or a relaxing, secure ride. Typically Zoom-Zoom, all forms throughout the cabin face forward. Their origins appear to flow through the interior from a theoretical vanishing point in front of the car, intensifying the sense of motion and speed - even when the new Mazda 3 is at a standstill. Cockpit is certainly the right word for the driver's space. Its powerful lines and ergonomic layout enable drivers to focus effortlessly on the road. Fittingly, the newest driver-friendly feature was borrowed from supersonic jet fighters. As one of the first models in the C segment, the new Mazda 3 comes with a new head-up display called the Active Driving Display. It projects the most important driver information, such as speed and active safety system warnings, directly into in the driver's forward line of view. Drivers react best when comfortable, so Mazda positioned the controls needed to directly operate the vehicle in such a way as to maintain natural angles and thus a relaxed posture. They feel like extensions of the limbs. The steering wheel, for instance, is lower than in the current model and brings the car closer to the driver, while the pedals are laid out symmetrically to the left and right of the driver's centre axis in the most optimal positions. The gearshift knob, too, fits like a glove in the palm of the hand. It all contributes to minimising strain on the driver and thus preventing fatigue. As mentioned, the rear-leaning cabin is a core KODO design trademark, and the A-pillars on the new Mazda 3 have been pushed back by 100mm. One advantage here is improved forward visibility and an outstanding field of view. Along with the repositioned side mirrors, this further alleviates stress potential for the driver, especially at intersections and in corners or bends. Mazda even studied eye points to fine-tune the shape and thickness of the A-pillars so they would not have an oppressive effect on front occupants. It's one example of how the KODO's compact exterior look is advantageous on the inside: The increased width and wheelbase on the new Mazda 3 - the longest in the segment - gave Mazda room to work with. Accordingly, both hatchback and sedan offer best-in-class shoulder room front and rear, and are close to it in terms of legroom. The interior is, in fact, larger and more comfortable than its predecessor in most respects, from foot space to knee room and more. And Mazda maintained headroom, despite a 25mm reduction in the car's overall height, by lowering the hip point of the seats. The driver's seat offers 260mm of front-to-back adjustment, 102° of recline and 56mm of vertical adjustment, including an extra 20mm of downward range for taller drivers. Mazda stuck to the fundamentals with seats that wrap around occupants, supplying a natural position with good support and plenty of hold. The enhanced vibration-suppressing seatbacks feature a bolstered shoulder area and a larger cushion to go with their sleek, dynamic form, which complements the interior's clean sporty style and solidity. And because they're even slimmer than before with concave hollows in the back, rear passengers get additional knee clearance. There's more room for their feet, too, since the front seat mounts were shifted further apart. Indeed, the second row has a decidedly unrestricted feel to it thanks to narrower front headrests and shoulder sections, bigger rear windows, and the fact that the rear seating positions are closer to the middle. Those in the back simply get a better view of the world. As far as upholstery goes, the all-new Mazda 3 comes in a choice of black leather with red stitching, either alone or combined with off-white leather and white, grey and red stitching. Black fabric is also available with different patterns in a metallic lustre. Consistent with the roomy effect, the front passenger side is highlighted by a horizontal decorative panel, which serves to "widen" the space. The dashboard's virtual lines extend through the harmonious side air vent louvers and door handles back to the B-pillars, accentuating the pureness and unity of the cabin design. The centre stack also offers a simple, functional layout. The climate control system, which is located below the centre air vents, features a sleek three-dimensional look with circular controls. On top of the dash, the 7-inch touchscreen is easily accessed by the passenger or driver, but without distracting the latter from operating the vehicle. Overall, the interior finishing is emotional and stylish while at the same time adding a certain logic to the cabin - particularly in regard to the various controls and areas surrounding them. The sportiness of the black keynote colour is enhanced by contrasts that intensify the quality look and feel, such as the enthusiasm-sparking carbon fibre look or the black leather steering wheel with matching parking brake lever, armrests and gearshift boot. Combinations like these or the dignified piano black surfaces set next to metallic satin chrome elements confer a youthful sophistication. Rational, balanced and unifying, the new Mazda 3 cabin is an extraordinarily refined environment, with attention to detail that's every bit as meticulous as elsewhere. It's certainly going to be a hard act to follow. Hatchback or sedan, the all-new Mazda 3's luggage compartment offers comfortable access to the abundant capacities of 350 and 419 litres respectively - in both cases more than in the current model. Fold down the rear seats of the hatchback, and there's 1,250 litres of cargo space. With its boot opening widened by 100mm, meanwhile, the sedan can handle three 67cm suitcases. Designed with the different interior zones in mind, the various cabin storage possibilities allow occupants and particularly the driver access to items with minimal eye movement. In the front, for example, there is a large stowage space at the bottom of the centre stack, door pockets able to hold 1-litre bottles, and a sunglasses holder in the overhead console. Front and rear passengers also get large cupholders in the centre console or armrest. This is where the all-new Mazda 3 really starts to grow on you. In tune with the demands of the modern world, Mazda has taken great strides towards making the automobile experience complete. The way people look at their car is about to change dramatically. The fact is, with all the features and functionality available in vehicles these days, motorists have to deal with more information than ever. This hasn't gone unnoticed at Mazda, focused as always on delivering the most enjoyable driving experience possible. Company developers realised that a new concept for the automobile cockpit was needed if drivers are to safely digest all this input and reap full advantage of increasingly advanced onboard systems. Mazda's goal: Make interactivity and connectivity in the cabin more advanced than ever, but at the same time as usable - and safe to use - as possible. In doing so, company designers set out to minimise the danger stemming from inattention to the road ahead, distractions and physical stress. What they came up was a new human-machine interface (HMI) for the new Mazda 3 featuring an innovative set of displays and controls. The most vital information is positioned to enable the driver to read it with negligible eye movement. Like the separate driver and passenger spaces described in chapter 4, this concept distinguishes between a safe-driving zone and an infotainment zone. The various controls follow this model, too, with a consistent design and layout for each zone to distinguish their respective purposes. Mazda developed intuitive mental models reflecting how users expect control and display systems to work to create an environment that enables drivers to judge and act without hesitation. The cockpit is thus designed to allow accurate reactions with little exertion of energy and no wasted movements, letting the driver maintain a stable posture while remaining relaxed and alert even on long trips. Unsurprisingly, the most frequently used controls and switches, including those needed to adjust driving operations, can be found on the steering wheel. Those for infotainment features, meanwhile, are located elsewhere. Real-time driving information like speed, navigation system directions, and the status of i-ACTIVESENSE active safety systems, including warnings, are shown on the Active Driving Display. Among the first vehicle in this segment with such a head-up display, it uses a clear panel mounted on top of the dash above the instrument cluster. The system, which adjusts automatically to ambient light, projects the information with the focal point around 1.5m ahead of the driver's eye point, minimising focal adjustment and eye movement. To avoid confusion, only three items appear at once on the Active Driving Display. The most important piece of data is always at the top, changing according to priority. For example, an urgent active safety warning will immediately displace whatever information is at the lead - say the vehicle's current speed - changing back again once the danger has ceased. All other driver-related information can be found on the instrument panel, which was completely redesigned for the new Mazda 3. It features a centred analogue tachometer with a digital speedometer flanked by two wing-shaped digital displays. These show status info like temperature, fuel level, gearshift information and odometers. Communications and entertainment-related information (from the infotainment zone) appears on the new 7-inch display, which is controlled either by touchscreen, voice command or the new rotary commander. Located on the dash above the centre stack rather than in it, the downward viewing angle for the driver was reduced from 28° on the current model to 16° on the new Mazda 3. So the display is less distracting for the driver and easier for the front passenger to see and use, too. Whether setting a destination in the navigation system, searching for music to play on the BOSE® premium surround sound system, checking email or calling up the latest Facebook posts, the path from "home" to the desired operation is shorter than ever. Users can also set shortcuts to their favourite functions. In any case, only "7 plus/minus 2" items appear on the screen at a time - the maximum people can handle at once according to psychologists. Mazda also redeveloped the rotary commander located on the centre console to improve "blind" operation of infotainment features. It is now positioned so that the driver simply has to remove one hand from the steering wheel and grip the dial in a natural, effortless motion without changing posture. The new commander is surrounded by five buttons - one per finger - each corresponding to a specific function: navigation system, "home", and audio system in the middle with "back" and "favourites" on the sides. There is also a volume knob next to the commander. All the controls can be accessed comfortably and conveniently with the elbow perched on the centre armrest. Voice command is another safe and ergonomic alternative for infotainment features like menu switching and selecting radio stations as well as audio play/stop/skip or zooming in and out of the route map. And with a smartphone or music device connected, occupants can search music and contact list names or input addresses to the navigation system by voice. Mobile technology like smartphones has irreversibly changed lifestyles. Social media, too, has transformed the way people see and experience culture. Mazda has now brought this reality into car with the brand-new mobile connectivity concept being introduced on the new Mazda 3. The in-vehicle system expands on features already available in Mazdas, like Bluetooth®, email, SMS and navigation, adding a whole new scale of connected convenience. Using a smartphone connected to the Mazda 3 system via Bluetooth® or USB, Mazda 3 occupants have safe and easy real-time access via the 7-inch display to infotainment services from AhaTM. It offers a wide and growing range of mobile infotainment content and social media services, including tens of thousands of internet radio stations, Twitter and Facebook feeds, news, audio books and more. Listen to the latest tweets or Facebook posts using the text-to-voice readout function, replying with "like" or posting audio messages with the "shout" function. Or send and receive email and SMS messages with the sender ID on the display. Readout works here, too, as do onscreen edit and reply features. The connectivity system also supports playback from other connected mobile devices and works in 25 languages for audio and 38 for text. Connecting is simple via the external hub, which includes USB and AUX ports as well as an SD card slot for the navigation system. The hub is conveniently positioned in the centre stack or, on models with CD player, in the box at the rear of the centre console. Either way, storage cavities are on hand for the mobile devices. The mobile connectivity concept by Mazda offers a range of vehicle information through Mazda's own applications, too, including maintenance reminders and warnings as well as the Eco-display. It shows the status and activity rates of the i-ELOOP brake energy regeneration system and i-stop idle-stop system as well as fuel economy and CO2 emissions, enabling drivers to track changes and history. Expanding the driving experience, Mazda now connects the driver, passengers and the car to today's interactive world - safely and efficiently. At the same time, it also connects occupants to the new Mazda 3, further strengthening the growing bond between man and machine. And that's not the only way Mazda takes its characteristic Jinba-Ittai sensation of "horse and rider as one" a step further in its latest compact. AhaTM is a cloud-based automotive grade internet connectivity platform. Available for the first time at Mazda with the all-new Mazda 3, AhaTM is designed to provide a single integration point bringing a wide range of free web-based infotainment content safely into the vehicle. Using a "radio-like" audio format, the AhaTM concept is to make this content as easy to use as a car radio and thus provide internet infotainment in a manner conducive to safe use in a vehicle environment. AhaTM lets the user access and organise their favourite web content on their phone, then seamlessly integrates the experience in their car. 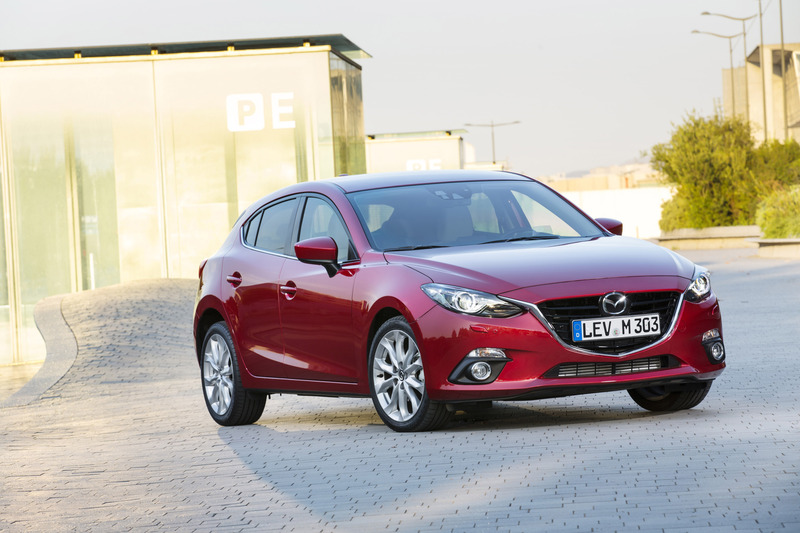 AhaTM is accessible in the new Mazda 3 via a free smartphone app and covers most of Europe. Free content currently includes more than 30,000 stations including radio, podcasts, social media, audio books, personalised location-based services and more. Services are expanding continually, too. And since all system updates take place via the cloud, the platform is future-proof, keeping things as simple as possible on the car and user side. With a variety of comfort and convenience features, the navigation system on the new Mazda 3 helps drivers reach their destinations safely, less stressfully and better informed. Safer, easier and more relaxed for the driver, since turn-by-turn directions are shown on the Active Driving Display as well as the centre stack display. Real-time information using RDS-TMC along with accumulated statistical traffic congestion data (stored with the maps) and the latest online traffic info to deliver the most accurate route calculations. Developed together with BOSE® especially for the new Mazda 3, the new 9-speaker BOSE® premium sound system features the latest in playback technology and, of course, plenty of power. Uncompromising like the Mazda 3's SKYACTIV Technology, the system comes with the most advanced audio features ever, yet weighs 20 per cent less and is more energy efficient than its predecessor. For example, since the amplifier generates less heat, there is no need for large metal cooling fins. So it's lighter and smaller, but with no trade-off in performance. The audio system features Centerpoint® 2 digital signal processing, which analyses the frequency of the sound source to deliver a rich virtual multi-channel surround experience, even from MP3 and other compressed files or the radio and audio content accessible via the newly introduced mobile connectivity system. The Mazda 3 marks the debut for Centerpoint® 2 in the C segment. AudioPilot® 2 noise compensation technology, meanwhile, compensates for the effects of sounds from road surfaces, changing speeds, and even an open window. It uses a cabin microphone to monitor ambient noise, automatically adjusting the music signal accordingly - and letting the driver focus on the road. Open the door of the all-new Mazda 3, and something exciting happens. It starts to awaken. Sit down behind the wheel and feel the heartbeat with the pulsing red ring of the instrument cluster. Turn on the engine and watch as the needle lights up along with the gauges and other instruments. Then the Active Driving Display rises into position, concluding the start-up sequence. The all-new Mazda 3 is ready. It's time for adventure. Get going and encounter the next pleasant surprise: discovering how the new Mazda 3 responds to input from the driver's foot on the accelerator pedal. With absolute precision, namely, because of Mazda's enhanced accelerator control. It lets the driver adjust pressure for exactly the desired acceleration, also enabling better command over automatic transmission downshifts. And with the enhanced engine sound synchronised to the pedal input, the driver is immediately greeted by a satisfying din to match the zippy accelerator response. It's a fulfilling experience to be able to get to "know" and master the car so quickly. Under the hood is a choice of three naturally-aspirated petrol powerplants and one turbodiesel. The former include the brand-new SKYACTIV-G 1.5, a highly efficient and exceptionally frugal engine, needing only 5.0l/100km of fuel (combined cycle) paired with the six-speed SKYACTIV-MT manual gearbox. That's good for CO2 emissions of 118g/km - an 18 per cent improvement over the 1.6-litre MZR engine it replaces thanks to the unique SKYACTIV-G characteristics. These include its lightweight design, exceptionally high 14:1 compression ratio, 4-2-1 exhaust manifold and i-stop, Mazda's idle-stop system, which is standard equipment on the new Mazda 3. At the same time, the SKYACTIV-G 1.5 produces more torque (150Nm @ 4,000rpm) than the current 1.6, delivering it smoother and earlier across the rpm range. With a competitive 74kW / 100PS at 6,000rpm, it manages the 0-100km/h dash in 10.7 seconds and a top speed of 185km/h. 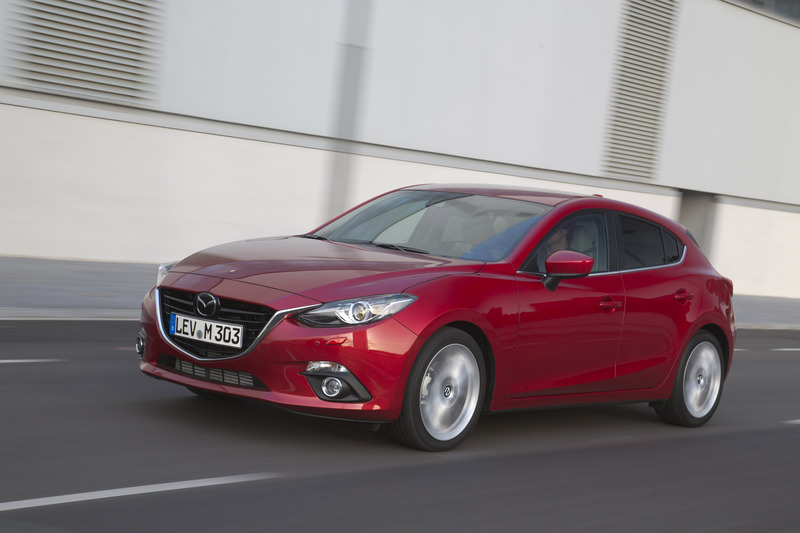 The new Mazda 3 also comes with the SKYACTIV-G 2.0 in two versions. The high-power version churns out 121kW / 165PS at 6,000rpm and 210Nm at 4,000rpm. Available for the hatchback with manual shift and i-ELOOP, Mazda's unique brake energy regeneration system, it thrusts the compact from a standstill to 100km/h in 8.2 seconds with a terminal speed of 210km/h. At 5.8l/100km and 135g/km, fuel consumption and CO2 emissions are very respectable for such performance - and 14 per cent better than its 2.0 MZR DISI i-stop predecessor despite generating 10 per cent more horsepower and torque. The standard power SKYACTIV-G 2.0, meanwhile, puts out 88kW / 120PS at 6,000rpm and, like its sibling, 210Nm at 4,000rpm. Available for both body styles with either the SKYACTIV-Drive automatic or SKYACTIV-MT manual transmission, this economical option combines first-rate fuel efficiency and CO2 emissions - 5.1l/100 km and 119g/km (manual) and 5.6l/100 km and 128g/km (automatic) - with respective sprint times of 8.8 and 10.3 seconds, topping out at 198km/h. The SKYACTIV-D clean diesel also uses extreme compression and lightweight design as the basis for powerful yet remarkably fuel-efficient engines. Featuring a twin turbocharger and a common-rail system with multi-hole piezo injectors, the SKYACTIV-D 2.2 delivers an unprecedented combination of excellent mileage and dynamic performance while significantly reducing nitrogen oxide (NOX) and soot emissions. Unusually for a diesel, the 380Nm of maximum torque at 1,800rpm and 110kW / 150PS at 4,500rpm offers satisfying pull from a standstill through to its 5,500rpm redline. With a SKYACTIV-D 2.2 under its bonnet, the new Mazda 3 takes only 8.0 seconds to reach 100km/h with a manual and 9.7 seconds for the automatic (hatchback only), with respective top speeds of 213km/h and 201km/h. And that with fuel economy and CO2 emissions of 3.9l/100km and 104g/km (sedan with manual), and 4.8l/100 km and 127g/km (hatchback with automatic). The SKYACTIV-D 2.2 is truly clean, too, complying with Euro 6 long before it takes effect in September 2014, and without needing pricey NOX aftertreatment. Specially developed to complement SKYACTIV engines, both six-speed SKYACTIV transmissions offered for the new Mazda 3 respond faithfully to the driver's intentions, delivering linear power directly to the front wheels while also contributing to significantly improved fuel economy. The SKYACTIV-Drive automatic, available for most Mazda 3 engine-body style combinations, shifts smoothly and precisely while giving the driver exceptional control over downshift behaviour. The sporty shifting of the SKYACTIV-MT manual gearbox, meanwhile, is reminiscent of Mazda's famous MX-5 roadster with its satisfyingly short, direct stroke. 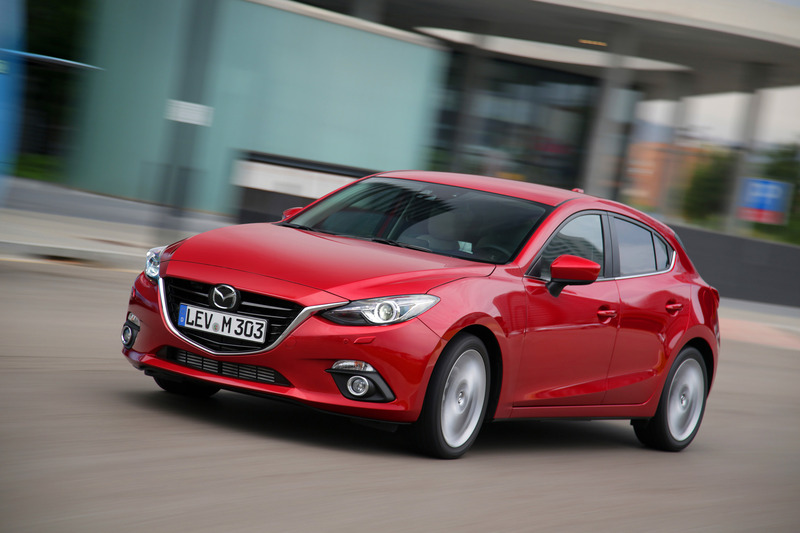 Both gearboxes are lighter and more compact than those on the current Mazda 3, too. But performance is only one aspect of the sports car feeling. The handling of the new Mazda 3 is every bit up to these capable powertrains, particularly in the way the car does exactly what the driver wants. It's all coming together. Most automakers have adopted a downsizing strategy, particularly for their petrol engines, reducing the displacement and sometimes the number of cylinders while adding technology such as turbochargers to make up output. The theory is that a lighter engine makes for a more efficient car. Defying convention as always, Mazda has foregone this approach with its range of four-cylinder SKYACTIV-G petrol powerplants, opting instead for ultra-high compression ratios, natural aspiration and a lightweight design to come up with the best possible balance of output and fuel efficiency. 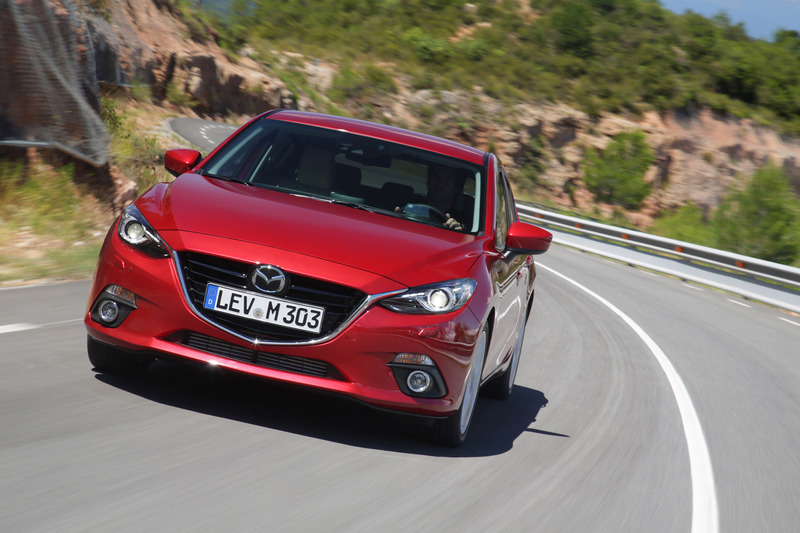 A case in point is the 120PS standard power SKYACTIV-G 2.0 offered on the new Mazda 3. Designed to compete against downsized turbo engines with similar horsepower ratings, this 2.0-litre delivers comparable overall performance and combined New European Driving Cycle fuel economy. But where it really sets itself apart is in real-world fuel efficiency - like on Europe's high-speed motorways - since the SKYACTIV-G uses less fuel than its downsized and turbocharged counterparts in all areas of the horsepower band except the lower range. It also enables more linear acceleration, with a smoother performance curve and extra pull, particularly at high rpms. All in all, it's a truly customer-oriented solution for the new Mazda 3 and in line with Mazda's Jinba Ittai horse-and-rider-as-one driving experience. Always a blast to drive, the all-new Mazda 3's nimble handling and faithful linear responsiveness has evolved to a previously unseen degree of sophistication. The bond with the Mazda 3 strengthens with each journey, and you may actually find yourself becoming a better driver. You'll certainly want to keep practising. First introduced on the Mazda CX-5 and the new Mazda 6 - each "models" of driving joy in their respective classes - the lightweight SKYACTIV-Chassis and SKYACTIV-Body combine high-performance behaviour with superb aerodynamics, safety and NVH. These qualities are even more pronounced on the lighter Mazda 3, made-to-order for SKYACTIV with its compact C-segment proportions. Mazda tuned the new Mazda 3's SKYACTIV-Chassis to respond more faithfully than ever to driver intentions. Take cornering as an example. The driver experiences something like absolute control, with the tires gripping the road as the car's neutral steering guides it accurately through the curve. There's no sign of the understeer common to front-wheel drives, with a smooth and desirably predictable pitch and roll as the load shifts from one side of the car to another. The harmonious linear response to and feedback from lateral and longitudinal g-forces means there is rarely the need to correct the steering. And no overreaction from the car, either, when braking into a curve, turning through it or accelerating out of it. The driver knows exactly what to do, and it's quite a fulfilling feeling. The perfectly-balanced Jinba Ittai suspension and steering serves up an exceptionally comfortable yet nimble and reassuring experience. High-tensile steel (780MPa) was used for the lower suspension arms on the front MacPherson struts and rear multi-link trailing arms. This not only makes the suspension lighter, but also smoothens load transfers and with it changes in cornering g-forces. And because the front suspension is mounted on a new perimeter frame with an increased caster angle and trail, it improves self-aligning torque and high-speed stability. The positioning of rear suspension links and hardness of the bushings, meanwhile, improves the lateral grip of the rear tires. By moving the trailing arm position forward, the dampers can better absorb road influences. The dampers themselves were optimised to strike an ideal balance between nimble handling at low to medium speeds and stability when going faster, not to mention ride comfort and braking. Measures used on the new Mazda 6 to improve rigidity, such as expanded cross-sections and larger side members, were carried over to the frame of the new Mazda 3 building a top-class chassis in terms of stiffness. avoid driver fatigue, particularly on winding roads and in the city. The system is smaller, lighter and more energy efficient, too. The brakes get smaller cylinders, retuned boosters and reduced pedal play to suppress motion resistance. These improve brake control, responsiveness and fuel economy. In combination with new high-grip tires, they're particularly effective on wet roads: Stopping distances are considerably shorter than the current model and among the best in the segment. 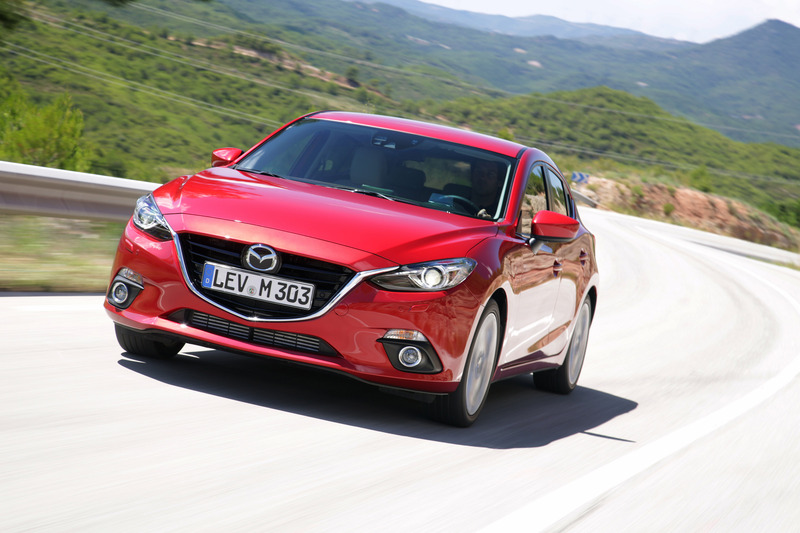 Like the SKYACTIV-Chassis, the SKYACTIV-Body on the new Mazda 3 features a stiffer yet lighter structure. That boosts fuel economy and safety as well as ride comfort and driving enjoyment - or in other words the emotional and economic well-being of its owner. Common to all SKYACTIV models, the body follows a concept of continuous frameworks, straightened sections and reinforce joints to disperse impact energy throughout the structure but around the cabin. 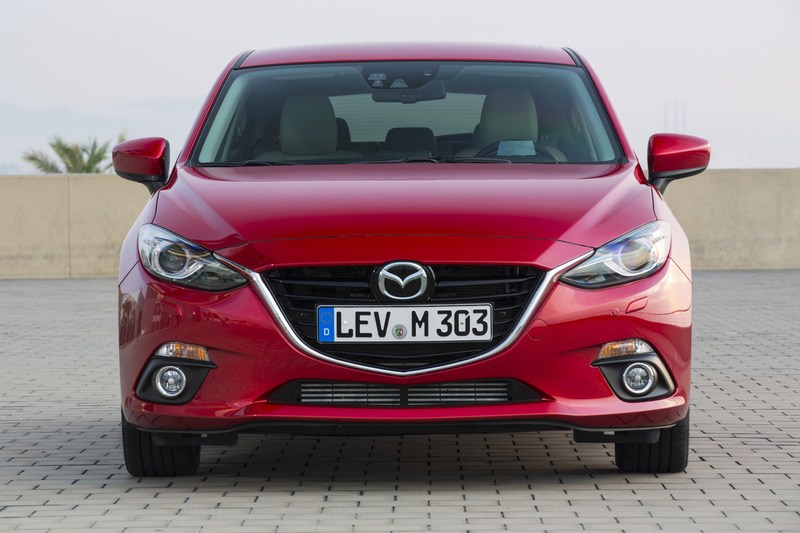 It also contains far more high and ultra-high tensile steels than the outgoing Mazda 3. This, of course, makes the new Mazda 3 stronger - torsional rigidity is 31 per cent higher on the hatchback and 28 per cent on the sedan - and lighter at the same time. 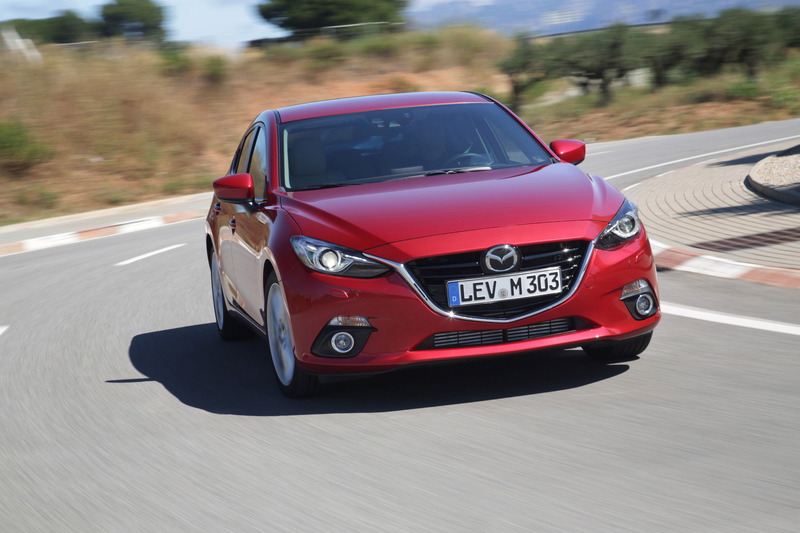 The aerodynamics contribute further to the Mazda 3's superb stability and mileage. Mazda engineers streamlined air flow underneath the car with, for example, new underbody covers and tire deflectors. They also added an active air shutter, which smoothens airflow by keeping the lower front grille closed unless the engine needs air for cooling. Added fuel efficiency enhancing advantages here include faster engine warm-ups and more ideal operating temperatures. And by optimising upper body airflow, the rear spoilers on the hatchback roof and sedan boot produce a symbiotic effect with under-floor airflow to suppress turbulence. As a result, the new Mazda 3's drag coefficients - 0.258 for the sedan and 0.275 for the hatchback - are among the best available today on a mass-production vehicle. Lighter cars tend to vibrate and produce more cabin noise. So Mazda carefully analysed the sources, like the engine and tires, blocking noise paths into the cabin and channelling them to sound-absorbing materials fitted in strategic locations like the dash, floor mats, under the rear deck behind the back seats and in the side trim of the luggage compartment. The lightweight sound insulation is especially effective at blocking unpleasant high-frequency noise. A balance shaft was also added to the SKYACTIV-D 2.2 to curb vibration entering the cabin via the engine mounts. Other components, like the stiffer powertrain, softer dampers and improved engine intake and exhaust systems, also help reduce cabin noise and road-induced vibration. The interior of the new Mazda 3 is as a result one the quietest in its class. As you get to know the new Mazda 3, you'll be getting to know refined comfort and sophisticated driving fun. The superior handling also makes this car safer to be in. Together with advanced body structures, there is less likelihood of getting hurt, or for that matter getting into trouble in the first place. So you'll get home safely time and again. It's all part of the concept. Everything about the all-new Mazda 3 will entice people to get more involved with it. To begin a relationship, to put people in touch and to inspire new discoveries. As a reliable companion, it's also designed to protect those in and around it - in more ways than at first meet the eye. Obviously, the extraordinary interplay between the suspension, steering, brakes and powertrains on the new Mazda 3 enhances control and with it safety. So do the interior layout and comfort by hindering driver stress, fatigue and distraction. Simply put, Mazda has built a safer car, coming up with a lightweight design that makes the new Mazda 3 easier to handle, yet whose rigid body and chassis structures eagerly absorb impact energy. It can all be summed up by Mazda Proactive Safety, the company's comprehensive approach to preventing accidents. The focus is to help the driver at every step along the way, from recognising potential hazards to minimising the risks of a colli-sion and then the damage should one nonetheless occur. And, of course, protecting both occupants and pedestrians through it all. The concept can be divided into three categories that support and build on one another: active safety (preventing risks), pre-crash safety (avoiding an accident or reducing damage) and passive safety (limiting harm to occupants and pedestrians). i-ACTIVSENSE is Mazda's term for its advanced range of sensor-based and radar-supported safety technology. The first line of defence - active safety - is to recognise potential dangers and notify the driver, who can then make an informed reaction. These systems help the driver keep an eye on the goings-on around the vehicle. The radar-based Rear Vehicle Monitoring system (RVM), for example, tells the driver when vehicles are approaching the new Mazda 3 from behind in adjacent lanes - including the blind spots - by activating an LED in the corresponding side mirror. If the driver signals to change lanes, the LED flashes and a buzzer sounds. 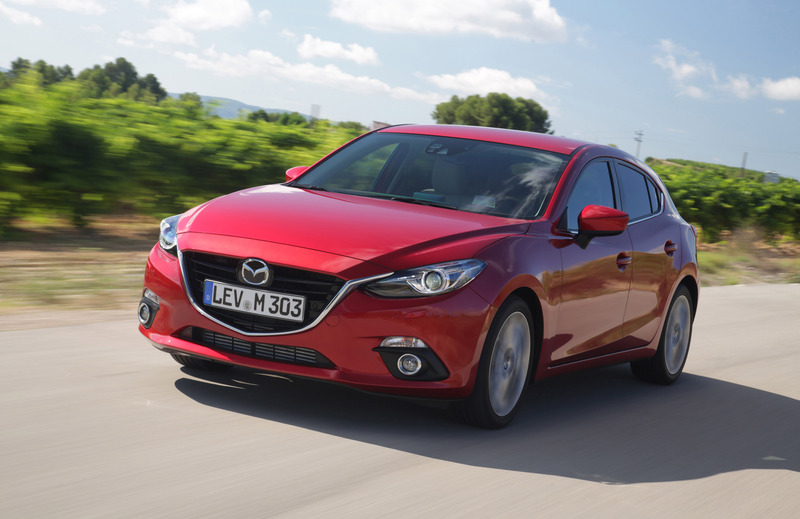 RVM, which won a Euro NCAP Advanced Award in 2011 after being introduced on the current Mazda 3, now works at speeds starting at 30km/h rather than 60km/h. The Lane Departure Warning System (LDWS), meanwhile, watches the lane markings at 65km/h and higher, alerting the driver with audible (rumble strip sound) and visual warnings should it detect unplanned lane changes. And the Distance Recognition Support System (DRSS) looks well ahead of the car, calculating and displaying the proximity and catch-up time to preceding vehicles at 30-200km/h. At Mazda, active safety also involves assisting other vehicles. One such feature is the Emergency Stop Signal (ESS), which rapidly flashes the four-way hazard lights to warn other motorists when the new Mazda 3 brakes heavily from at least 50km/h. High Beam Control (HBC) is another, using a camera to detect vehicles and automatically switching between low and high beams to avoid impairing the vision of other motorists. It also changes to low beams on well-lit roads and at speeds under 30km/h. On the topic of vision, Mazda's latest compact can even see around curves at night. The Adaptive Front-lighting System (AFS) predicts the shape of the curve ahead based on steering input and speed, turning the headlamps in the right direction. Hill Launch Assist (HLA) is another helpful system that maintains brake pressure to prevent rolling during hill starts. But what happens if the accident risk grows in spite of all this support? That's when i-ACTIVSENSE pre-crash safety technology kicks in. Like the systems listed above, these too warn the driver of potential danger. However, as names like Mazda Radar Cruise Control (MRCC) and Smart Brake Support (SBS) suggest, they'll also take evasive action if necessary to avoid an accident or limit the damage. Naturally, the new Mazda 3 also has standard ABS with electronic brakeforce distribution (EBD) and brake assist (EBA) as well as dynamic stability control (DSC) and traction control (TCS). Accidents still may happen, and that's where the vehicle itself - meaning its substance -is thrust into the starring role. Here as elsewhere, the new Mazda 3 is more secure than ever, with a formidable array of occupant-focused passive safety innovation. First and foremost, a lightweight yet highly rigid SKYACTIV-Body built to absorb impacts from all directions - front, side or rear - and channel them around the cabin. At the front, impact forces are absorbed by x-shaped crush cans and channelled through the multi-load paths built into the SKYACTIV-Body. Improvements here include a revised side sill structure to prevent the wheel intruding into the cabin during a small overlap frontal impact. Milder collisions at up to 15 km/h, meanwhile, are absorbed by easy-to-replace bolted-on parts to avoid expensive damage to the frame and engine components. For side impacts, a solid uninterrupted structure joining the roof and B-pillars to the underbody minimises cabin deformation and thus injury potential, again by controlling the flow of collision energy. Reinforced joints, additional impact bars and roof reinforcement cross-sections at double the size of the current model's are just some of the advancements here. As for rear-end collisions, the new Mazda 3features an enhanced double-hat shaped rear frame, for example, and bumper reinforcement made from 1,800MPa ultra-high tensile steel. These and other measures maximise the energy absorbed, protecting the cabin while preventing fuel tank ruptures. Absorbing impact energy was a major concern in the cabin, too. From the hollowed-out armrests to the new shock-absorbing material on the A- and B-pillars, Mazda redesigned numerous interior components and trim sections to soften any blow with occupants during an accident. The new Mazda 3 comes standard with the full range of front, side and curtain airbags as well as front seatbelts pretensioners for better restraint during a collision and load limiters, which subsequently loosen the belt to prevent excessive chest pressure. The seat cushion frame, seatback structure and headrests were redesigned to reduce injury potential. ISOFIX child seat anchorages are standard in the second row, while the rear seatbacks, mounts, hinges, catches and striker have all been reinforced to stop luggage from encroaching into the cabin. Finally, the bonnet and front bumper are designed to minimise injury resulting from an impact with a pedestrian's head and legs. After subjecting the new Mazda 3 to diverse crash tests, the company is confident that it complies with the strictest crash safety criteria worldwide. What this should add up to is the maximum five stars from Euro NCAP as well as its counterparts across the globe. A microwave radar sensor-based system, FOW keeps track of preceding vehicles at 15-200km/h, issuing a warning sound and visual "BRAKE" alert in place of the DRSS indicator should the new Mazda 3 get too close. An autonomous emergency braking system, SBS works hand-in-hand with FOW to monitor vehicles up to 140m ahead. Should FOW issue a warning, SBS first pre-fills the brakes and then applies them with a force corresponding to the level of danger. The pre-fill is cancelled if the driver responds to mitigate the risk. SBS, which like FOW works at 15-200 km/h, thus helps prevent or at least reduce the severity of a rear impact, even at high speeds. Designed primarily for urban driving, SBCS is Mazda's low-speed emergency braking system. It utilises a near-infrared sensor to monitor preceding vehicles travelling at 4-30km/h and up to 6m away. Like SBS, SCBS pre-fills the brakes if there is an increased accident risk, applying them when necessary. The two systems complement each other perfectly, covering the 4-200km/h speed range, and should normally prevent collisions entirely on dry roads at 30 km/h or less. Vehicles with autonomous emergency braking systems have up to 27 per cent fewer accidents than those without them, according to Euro NCAP, considerably reducing injuries. Euro NCAP will therefore add assessments of these systems to their vehicle safety ratings in 2014. So, unlike 79 per cent of models available in Europe, the new Mazda 3 - like the Mazda 6 and Mazda CX-5 - is already equipped for tomorrow. Another related system, MRCC also uses microwave radar to keep an eye on preceding vehicles. It automatically adjusts the throttle and brake pressure to maintain a safe trailing distance, which is preset by the driver. 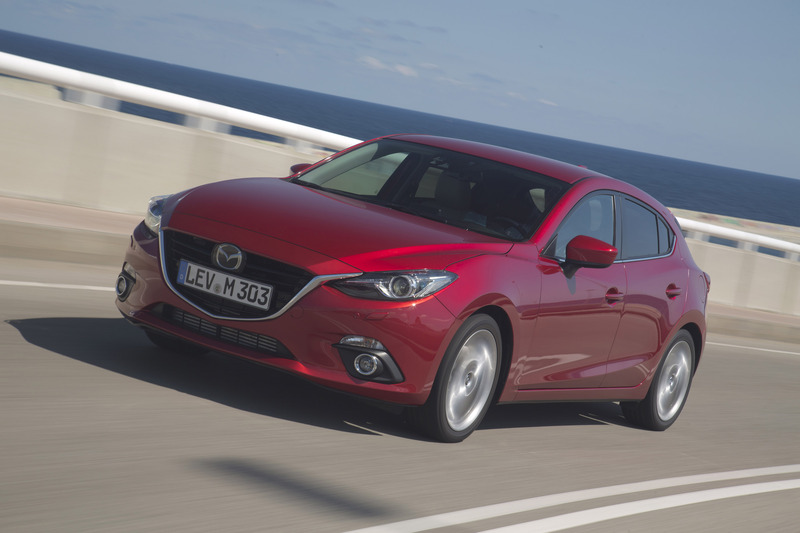 First introduced on the Mazda 6, the system is now available for the new Mazda 3. MRCC functions at 30-200km/h, enabling the system to adapt flexibly to changing traffic conditions. If a high-speed motorway becomes congested, for example, MRCC automatically adjusts to significantly shortened trailing distances. And it remains in operation when, say, exiting the motorway, decelerating on a curved off-ramp and then following a vehicle accelerating down the next road, only shutting off if the car's speed falls below 20km/h. The radar sensor accurately detects vehicles at up to 140m under any conditions - at night, in pouring rain or blinding sunlight. It therefore takes a huge load off the driver's shoulders, relieving stress and preventing fatigue - especially on long-distance journeys.